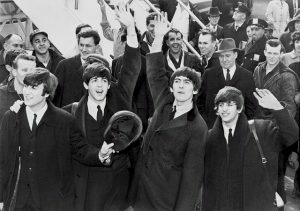 The Beatles were a phenomenon that swept the nation and the world. The likes of Paul Mccartney, George Harrison, Ringo Starr and John Lennon had never been encountered before. Boyish looks and music that spoke a reality that was unheard of. Deemed one of the most influential bands of the era. They formed in the 1960’s, during a time where war and freedom were at the forefront of everybody’s minds. Their genre of music cannot be pinpointed to one, their influences were drawn from a diverse field. Rock n Roll, Blues, Classical and Indian music to name only a few, were all incorporated into their unique sound. Abbey Road Studios in London was the birthplace of most of their albums. The Beatles were more than just another band. As the mid-60’s approached, they became bolder and more outspoken in their views and it showed. Rolling Stones Magazine lorded them as the most influential band of all time and their album “Sgt Pepper’s Lonely Hearts Club” the best album of all time. The Beatles personified everything that the youth of the time stood for. Their music, their style of dressing and their attitude. The popularity of the band reached astonishing heights. Fans would gather outside their hotel room by the thousands, basically keeping them prisoner within the walls. Venues became too small to accommodate their fans and they became the first band in history to perform in a stadium to close on 50 000 screaming Beatle lovers. Nearing the end of the 60’s, the Beatles gave up on their touring and live shows. They felt their music wasn’t heard over the wailing of the adoring fans. The pressures of fame and the need for each individual to find their own groove both personally and musically became a necessity.